For me, the best souvenirs are the memories. I don’t really need physical things to recall my vacations, as I’ll just look at the digital pictures and my mind fills in the blanks. Of course, many people like to bring home physical items to remember their vacations by. Sarah takes this route with her souvenirs. She likes to have a physical object to remind her of where she once traveled. It would be easy for Sarah to find a souvenir in a shop somewhere, but let’s be honest – most of those souvenirs are drastically overpriced and often not very useful. Who wants to pay $20 for an ordinary t-shirt or something silly like that? 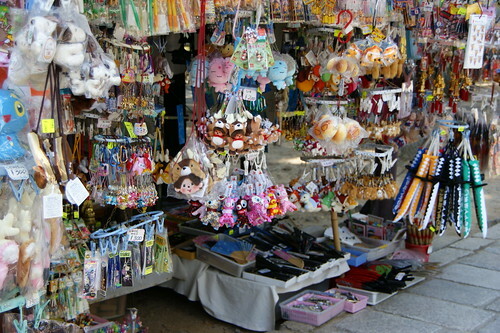 Instead, when she looks for a souvenir, she looks for something atypical, either something free or something without markup. One approach she often takes is to seek out elements of the environment. For example, on our trip to Oklahoma and northern Texas, we wandered about in the Arbuckle Mountains (an ancient and largely eroded away mountain range in Oklahoma) and found a wonderful red rock that currently sits in our garden. On our trip to Seattle, she memorialized our trips to the ocean by saving many of the seashells we found while wandering around. Another approach is to bring home a consumable item from a non-tourist location. She’ll buy a local bottle of wine or some local beer and bring them home with her, saving it for a while before enjoying it. Often, she’ll buy two of these things, consuming one while we’re traveling and then enjoying the other later on, as it creates a pretty direct connection of the senses to the trip. Because she purposely avoids souvenir shops, she generally finds such items at a much more reasonable price at non-touristy locations. A final tactic that works for frugal souvenirs is to mail yourself postcards from the trip. Simply spend a quarter buying a postcard, write what you’re doing that day on it, then mail it to yourself. When you get home and check the mail, you’ll find that postcard (and a few more will arrive in the following days), filled with your thoughts directly from the trip. It’s like a little reminder of your trip that arrives out of the blue. A truly special souvenir doesn’t need to cost very much, and the best ones are rarely found in an overpriced souvenir shop.